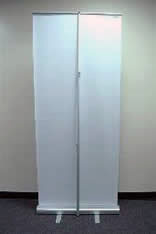 Dimensions of Banner: 33" x 78"
Dimensions of Retractable Banner Stand: 36"x5"x5"
Take this posture grid anywhere. To a conference/presentation, health club, outside events or as a mobile grid in your health/fitness/medical facility. 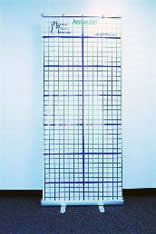 The 33" x 78" Posture Grid is printed on special lightweight durable/flexible vinyl. Initial set up takes only a few minutes, with regular set up in about 30 seconds. 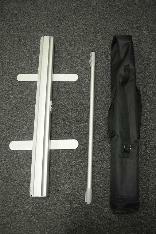 Just pull up the posture banner and attach to the support rod. The grid is comprised of eight major horizontal lines and one vertical line that are surrounded by two inch squares. This grid was specially designed to provide rapid visual cues of an individual’s posture to aid in correcting postural deviations and educating clients/patients on proper posture. This grid is great as a stand-alone posture education tool. With the light-weight base that the Posture Grid retracts into being only 36 inches wide, it can fit into most any assessment room. It's also fantastic to use with our National Posture Institute Posture Pro software. This grid also comes with an Online Instructional Video (75 mins/filmed in HD), and 4 Downloadable Assessment Documents included with purchase! 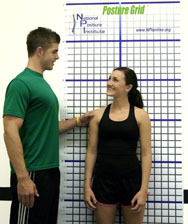 The posture alignment grid is perfect for the many applications and all assessments I perform. Whether it is dynamic and static posture assessment this grid and the digital camera are perfect in locating postural deviations and discussing them with clients. I did a lot of research before I bought this grid and was a little nervous with spending the money. However, after seeing comparable products quality and finally owning it for a couple weeks I am feel it is necessary for any true professional in fitness to utilize. The functionality of showing clients on a grid their deviations through a digital camera is perfect baseline data and also helps with signing clients. Also, the added bonus which helps me a lot is the ability for the grid to retract for easy storage in small fitness facilities like the one I am at. I would highly recommend this product for fitness professionals.